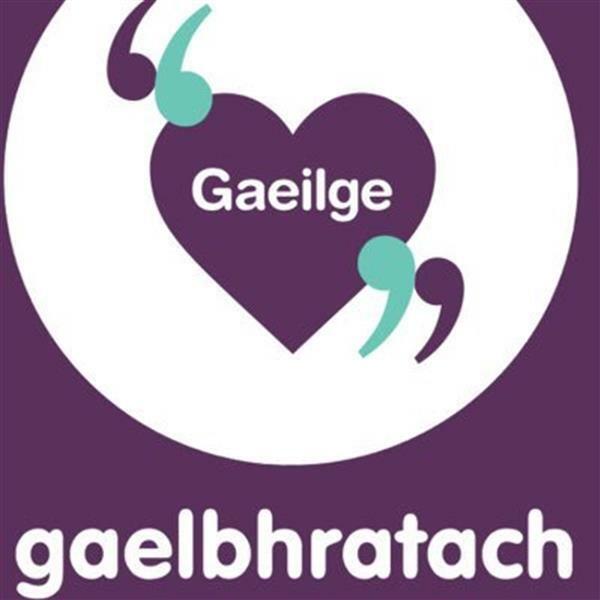 Féach ar Bhalla na Gaeilge i nGaelscoil Ros Eo. Ar an mBalla, tá Frásaí na Míosa agus Botún na Míosa. Chomh maith leo sin, bíonn frásaí úsáideacha air don chlós agus na diospóireachtaí. 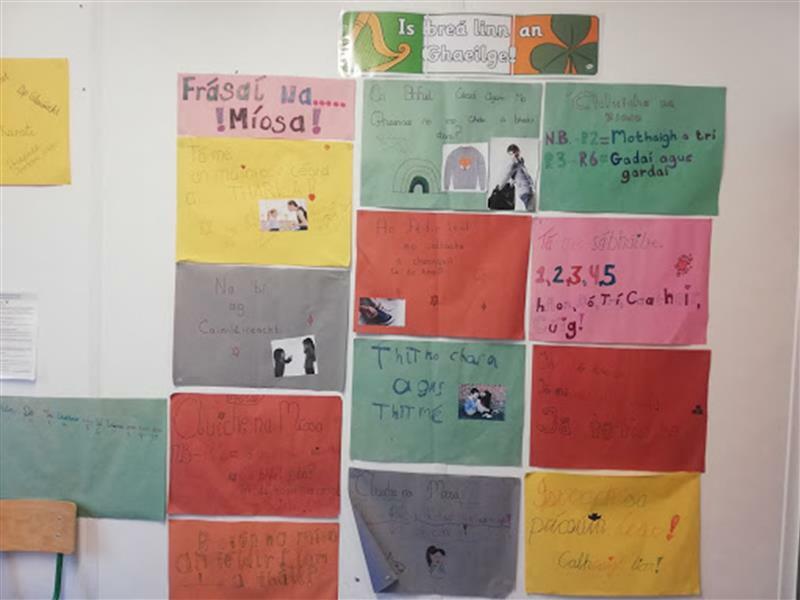 This is the Irish wall in Gaelscoil Ro Eo. It has the phrases of the month, the mistake of the month, other useful phrases for the yard and useful phrases for debates too! Mar chuid den scéim Gaelbhratach, tá cairt ghreamáin sna seomraí ranga uilig. 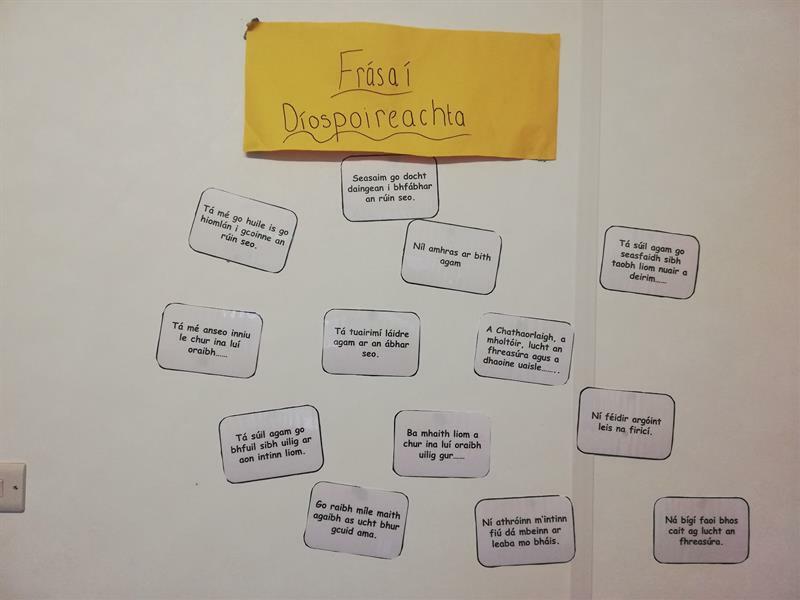 Má cloiseann an gcoiste na páistí ag úsáid Gaeilge mhaith, nó má chloiseann na múinteoirí na páistí ag úsáid Frása na Míosa, faigheann siad greamán. 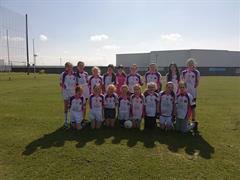 Má fhaigheann an rang 10 ghreamán, faigheann siad Pas Obair Bhaile don oíche. Féach ar chairt ghreamáin Rang a hAon tar éis roinnt mhaith greamáin a fháil. Maith sibh Rang a hAon! 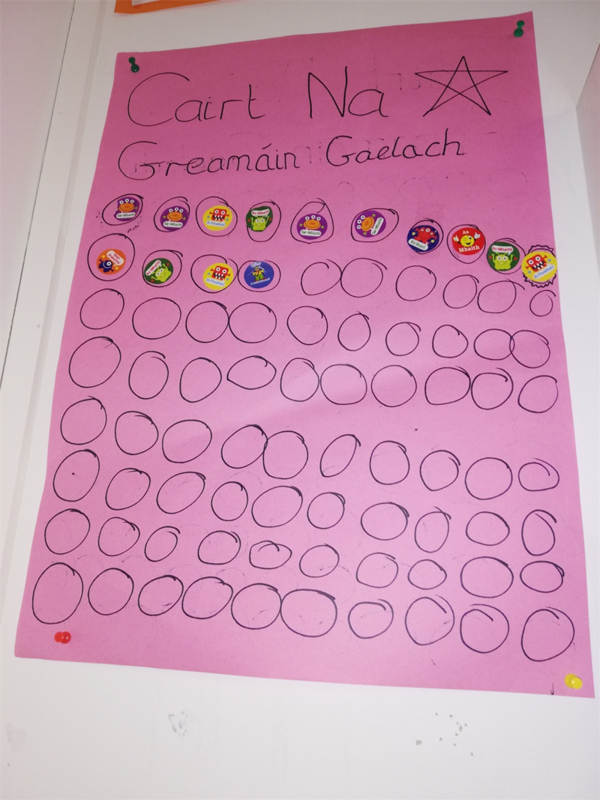 As part of the Gaelbhratach scheme, there is an Irish sticker chart in every classroom. If the Irish Committee hear the children making their best effort to speak Irish on the yard, of if the teachers hear them using the Phrase of the Month, they get a sticker. If a class earns ten stickers they get a Homework Pass. Here is Second Class’s chart after earning a lot of stickers. 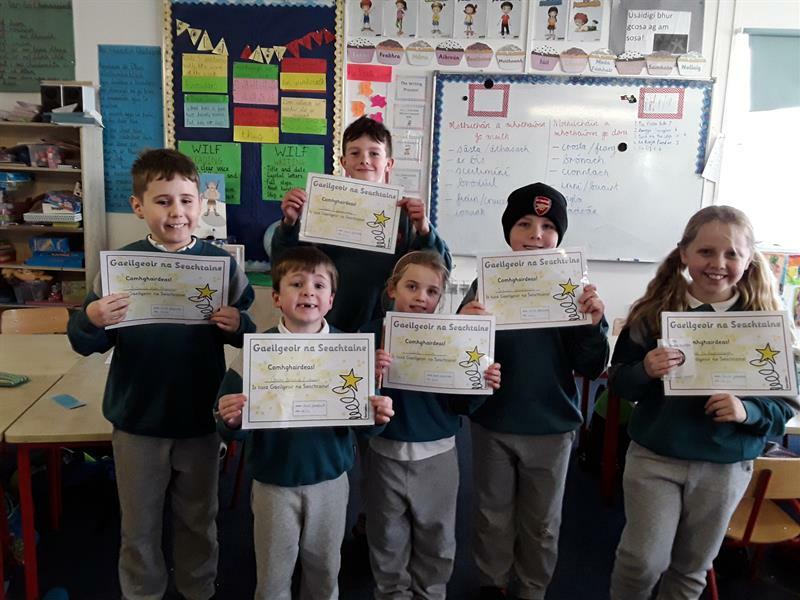 Well done Second Class! 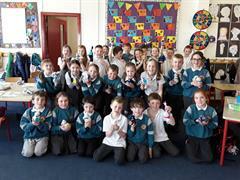 Mar chuid den scéim Ghaelbhratach, tá gach múinteoir sa scoil ag piocadh duine amháin ón rang le bheith mar Ghaeilgeoir na Seachtaine gach seachtain. Faigheann siad teastas agus duais gach seachtain mar bhuaiteoir. Maith sibh, a pháistí! Féach ar na buaiteoirí go dtí seo! 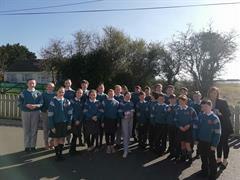 As part of the Irish Flag scheme, every teacher in the school is choosing one pupil as ‘Irish Speaker of the Week’. 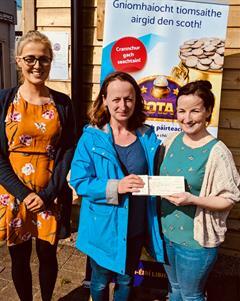 The winner of this prize is the person who has been making the most effort with their Irish speaking in class, yard, and even outside school. The Irish Committee then present this pupil with a certificate and a prize. Maith sibh! Look at our winners so far below!